Use ONE remote control to control all your audio/video devices, curtains, light, music, garagedoor, etc. and control your home from a computer. 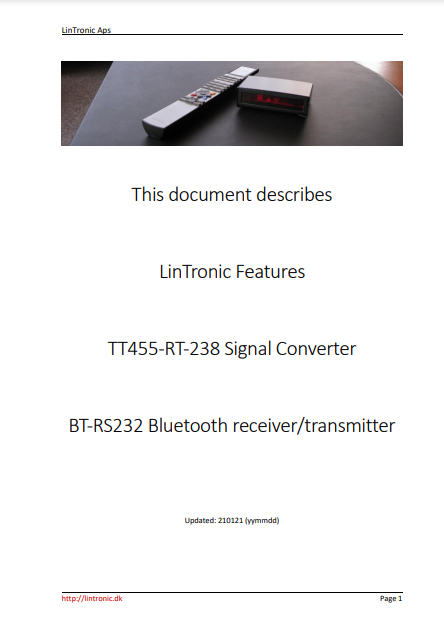 TT455-RT-238 is a Universal Signal Converter - typically operated from a computer/controller or by a remote control - controlling a wide number of Audio/video products, amplifiers, cd/dvd players, TVs, flatscreens, projectors, light systems, fireplaces, aircondition, curtains, relays, HomeAutomation programs and much more. Configured by mouse clicks only. No programming, no coding, no scripting. Controls audio/video, light, curtains, projectors, alarms, and much more. 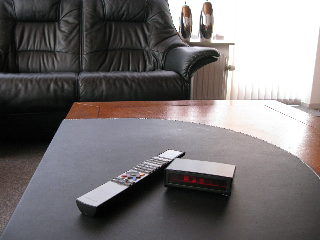 Converts signals from a remote control (Apple, Bose, Bang&Olufsen, NEC, Philips, etc.) into others signals. InfraRed, RS232, relays, RadioFrequency, etc. Converts X10 signals (IR, RF, PLC) into InfraRed, RS232, relays, etc. 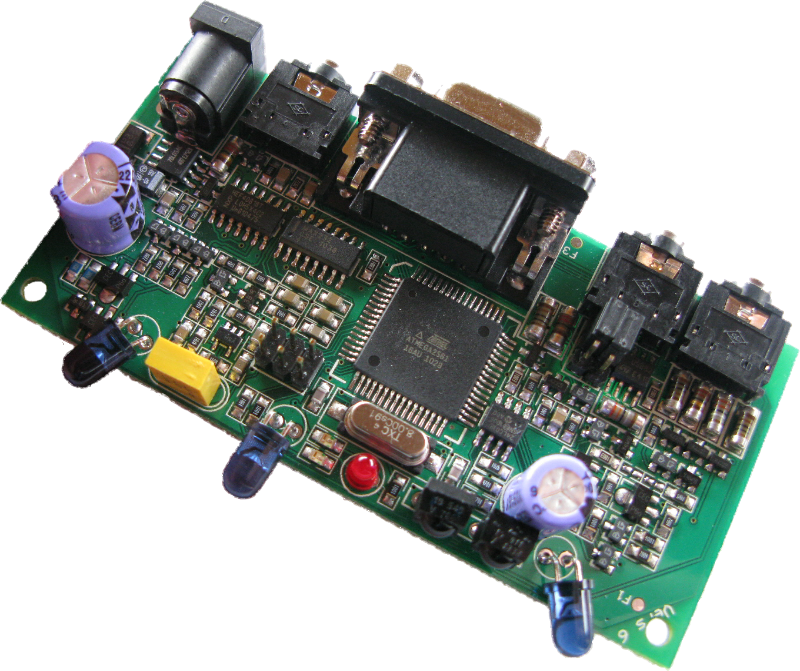 Converts InfraRed or RS232 into X10 signals IR, RF or PLC. High-power long-range wide-angle dual-band front IR booster. 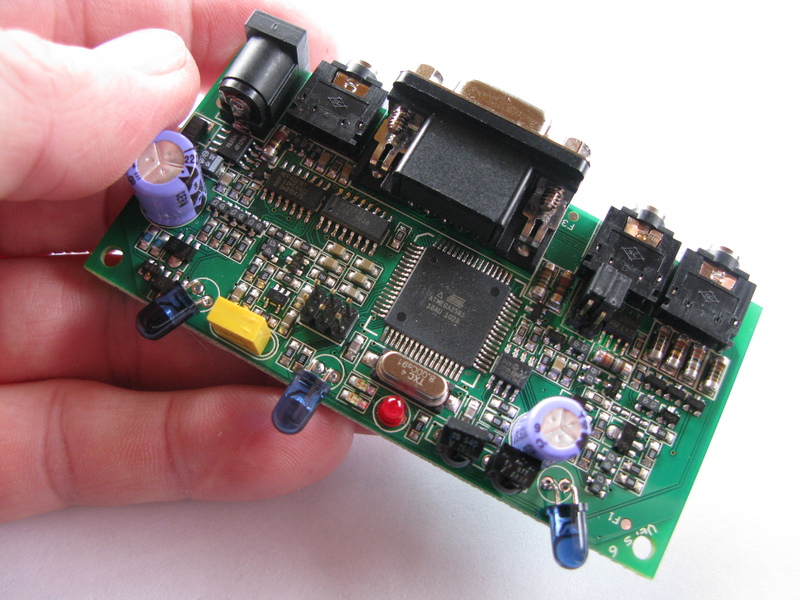 2 pcs low-power IR outputs for hidden installation. 2 pcs RS232 ports (4800-38400 bps). 2 digital outputs (controls relays, RF modules and digital inputs). Generates XML files for your Beo5, Beo6. Can be controlled from the MasterLink Gateway. Integrated BootLoader for unlimited firmware updates. The support is A+++. The TT455-RT-238 is brilliant. 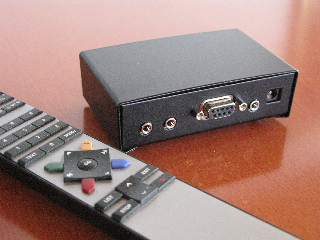 I have no software experience, but with this product I am controlling a plasma screen and a DVD player, that was just a quick test, the product is able to do so much more. The TT455-RT-238 is highly recommended. TT455-RT-238 can be used all over the world, since it is powered by a 12 volt dc adaptor. Insert a TT-IR-ET03 - if you want to control products in a closed cabinet. The IRLPO1 is part of the integrated IR distributor. We offer a well-documented communication protol allowing you to send IR or RF from computers like Crestron, Masterlink Gateway, etc. Our Command 915 allows integrators to read all incoming Triggers. An integrated BootLoader allows you to update future coming firmware. Digital inputs allow the TT455-RT-238 to be controlled by buttons, switches, relays, etc. The digital outputs can control relays directly . Factory feature for this programmable socket is to read the buttons on the external B&O IR receiver. Very nice feature if the remote control is misplaced. Alternatively it can be programmed to be a seconday IR lower power output. Insert a second TT-IR-ET03 - if you want to control even more products in a closed cabinet. The IRLPO2 is part of the integrated IR distributor. This is where you would insert the B&O IR receiver or your RF receiver. The micro-processor holds your configuration and controls all Trigger/Actions handling. The front IR booster is part of the integrated IR distributor. The integrated 3-way distributor can be used to control products is different cabinets. You can even control two identical devices seperately. due to the integrated hardware 455 KHz generator. The front LED confirms your Triggers/Actions. 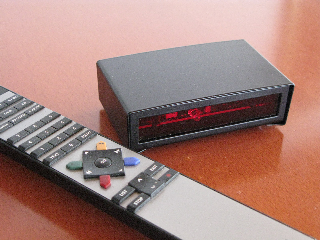 An integrated IR receiver is used to copy commands from your remote control. total control of for example repeat pattern. Our Configurator includes a HEX-LinTronic converter. We create XML files for your Beo5/Beo6. InfraRed: Remote controls from for example: Apple, Bose, Nec, Keyspan, Logitech, Philips, Pronto, etc. etc. Amplifiers/Tuners/DAB, Airconditioners, CD/DVD players, VCR/HDD players/recorders, SAT/CABLE decoders, MediaCenters, MP3 players, Soundprocessors, TVs, Screens, Projectors, Fireplaces, Light systems, Curtains, Blinders, Relays, etc. TT455-RT-238 controls up to 250 Actions. The 250 Actions can be shared by your products in any combination. The TT455-RT-238 automatically allocates the memory required to control each product as you design your configuration. TT455-RT-238 allows you to control up to 250 Actions by the same Trigger. You can change the sequence and timing and add delays to make it work perfect. TT455-RT-238 is configured on a PC by means of our free of charge Configurator program. No particular computer skills is required. After configuration you may use TT455-RT-238 as a stand-alone converter. (Configuration on a MAC requires you run a Windows XP licens under Parallels). TT455-RT-238 includes a 36-40 KHz receiver which allows the TT455-RT-238 to learn/copy/decode codes from your existing remote controls. TT455-RT-238 includes a DualBand HighPower LongRange WideAngle IR booster, capable of transmitting InfraRed signals from a huge variety of remote control code sets. As most manufacturers license an industrial standard code, our CodeCollection covers more than 95% of the markets remote controls and we are constantly adding more. TT455-RT-238 also includes 2 pcs low-power IR output allowing you to mount IR emitters on the front of your products, in case these are hidden in cabinets out of the TT455-RT-238's range. TT455-RT-238 also supports RS232 commands for many light systems, projectors, screens, computers, etc. If you wish to control a product by means of RS232 commands, then contact us with the commands/protocol, and we will embed it in the firmware. Use the specific value of 10 individual variables, to carry out certain tasks depending on the value (range 0-10). Quick and easy way to control for example the light scenario (mood) of dimmers in up to 8 rooms. We often add new functionality when customers or dealers present ideas for new features or in order to solve a specific matter or interface to a new product. 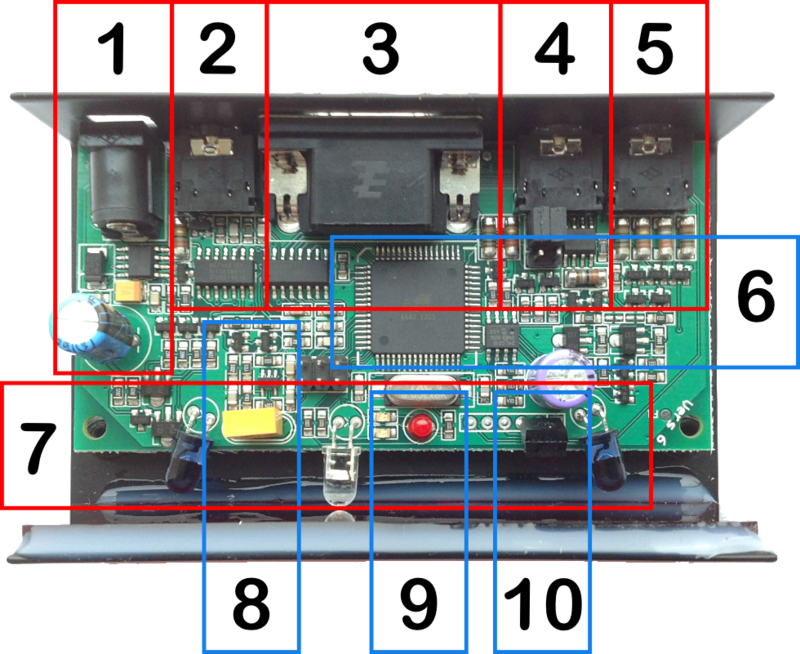 TT455-RT-238 includes a firmware updater ... a socalled BootLoader, capable of installing new/updated firmware holding more features, which ensures our customers and dealers, that they don't have to stock or sell outdated products.